A 70th wedding anniversary is a rarity. I’ll certainly never have one, and I’ve never personally known a couple who celebrated one. Julia and Monroe Hawley are celebrating theirs today — August 22, 2015. The Hawleys have spread much good influence through the years, particularly in the North Central states, according to the Christian Chronicle’s August edition. I don’t know the couple personally, but I do have one of Monroe’s books, Redigging the Wells, in which he attempts to call those in the American Restoration Movement churches back to restoration ideals. Anyone who does that type of thing, while coming to be known for having an “irenic spirit” and having a marriage that lasts 70 years, is worth of honor. And so I honor them here today. I heard it with my own ears. It was the fall of 1987, and I don’t claim to remember every word, every inflection, but I do remember 80% of it—and part of it verbatim—along with the the general tenor of the expression. Now, I had heard that some people in my “fellowship”¹ thought this way, but I, thankfully, had not been raised with such concepts. This kind of explicit rhetoric, this kind of sentiment was so wholly embarrassing that I’m not sure I really believed it was ever spoken or heard. But hear it I did. And, even at my tender age, in a church I was only visiting, I came infinitely close that night to standing up and calling out that horrificly audacious, ludicrous claim in public, in a crowd of several hundred. I was closer to causing cause a holy, real-time ruckus than I’ve ever come since. Suffice it to say this: I never returned to that building. I still receive the national, “brotherhood”¹ newspaper. I skimmed a positive portrayal, in the August issue, of this same church. The church is now known (at least in the paper) for being a church of love and service. In 1987: if I hadn’t heard it with my own ears, I wouldn’t have believed anyone would actually say it (the indented paragraph above). In 2015: since I did hear it with my own ears in 1987, it was difficult to believe the glowing report of this same church’s caring stance toward people in trauma. But some churches (and some individuals) can change. ¹ “Fellowship” and “brotherhood” are used in-house as euphemisms for that which is called “denomination” in most other circles. In my view, “denomination” is a more apt, and certainly less disingenuous, term, although the Church of Christ certainly doesn’t have all the trappings of a full-blown denomination. During a worship session at the 1998 Youth Advance with outstanding Christian teens in the Delaware Valley, I had asked the young believers to write down a two-word reduction of the core meaning of worship, as they understood it. Here, I shared most of the words they wrote. ¹ The ideas of love and service show that good things were in the teens’ hearts, of course, but those ideas are not much more related to worship than grace or atonement or repentance. Soon after dealing with Romans 12 as it relates to worship, I’ll describe some thoughts that shaped—and one response to—the worship times I planned for Youth Advance 1998. No, this is not a blog in which I write only two words. See? Already wrote 14 words. I mean 18. I mean 21. . . . 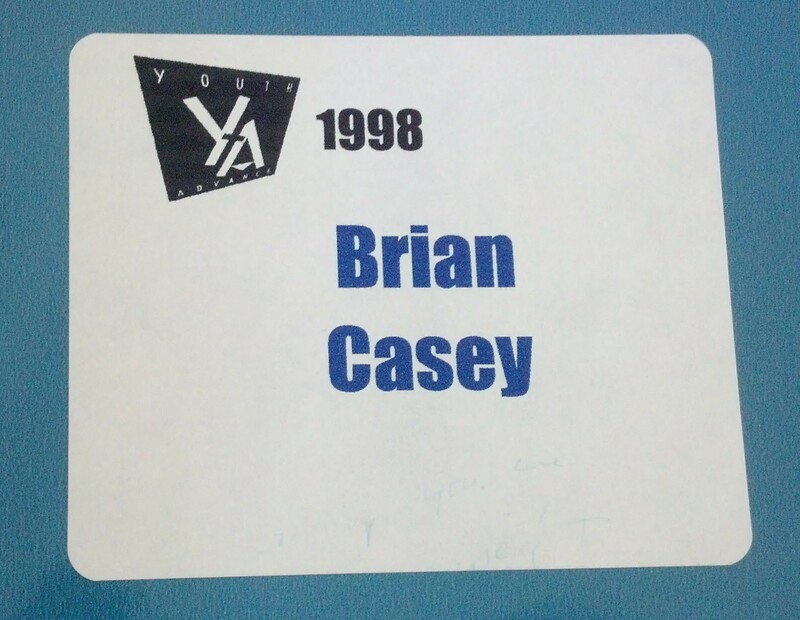 In culling old files, I came upon a folder from the 1998 Youth Advance, an annual conference event for Delaware Valley CofC teenagers who were identified by their church elders as future leaders. I had the honor of being a counselor and worship leader at the 1998 conference, held at Sandy Cove in nearby Maryland. During a worship session, I asked the young believers to write down a two-word reduction of the core meaning of worship, as they understood it . . . and in my paper file were the actual scraps of paper received from these impassioned, standout teenagers. Below are most of the words they wrote. I have italicized some of those I find the most insightful. Those Youth Advance teenagers were exceptional, and I remember several of them to this day — Alison, Mark, Crystal, Erin, Benjamin, Matt, Jonathan, Abigail, Julie, and others. And aren’t some of the two-word depictions amazing? Each one of those seems to capture one or more key aspects of worship. Some of them encapsulate the whole of it. Many churchians would do well to digest some of the above concepts; tragically, “worship” seems often to be reduced and/or misunderstood by religionists. Worship is not “church,” as in “get in the car; we’re almost late for worship,” and it is not equivalent to the assembly/gathering, either. One of the descriptions—”blowing kisses”—warrants a comment. I think I actually recognize the handwriting on this one. Even if I’m wrong, I can still be sure that this person either already knew, or had just heard from me on that occasion, that the principal root for “worship” is a compound one—προσκυνέω (proskuneo)—that involves “directional kissing.” In other words pros roughly means “toward” or “to,” and kuneo is the verb “to kiss,” i.e., as an act of homage to royalty. Far from being light or flippant, then, the person who wrote “blowing kisses” was actually asserting something very profound: that worship is expressing reverent love in God’s direction—from a distance, as it were. Next, I’ll share a few additional teens’ descriptions that are not as on-target. Subsequently, I’ll describe some thoughts that shaped the worship times I planned for Youth Advance 1998; then I’ll share an affirming response. In this third autobiographical essay, I’m dealing with Phase Three, where I currently find myself. Explanation of Phase Three. These days, I am unlikely to spend time going into the depths of this matter. (More could be, and has been, said by people more devoted than I.) I don’t relish spending time becoming enmeshed in extravagantly long discussions on matters I’m no longer very interested in. Flatly put, I simply don’t think the use or non-use of instruments in corporate worship is, in itself, of any real import. Certain background and surrounding issues are of some interest, but I’m persuaded that, if God really were concerned with the use of mechanical instruments, He would have provided clarity and force through scripture. As it is, the question is open, the debate is tenuous, and the arguments made by many of my CofC forebears are leaky, although for the most part well-intended. Some sessions I planned and led in the late 1990s in Delaware were effective in their use of (mostly) recorded instrumental tracks — more because of the worship-filled hearts and free spirits of those participating with me than because of my use of technology or the specific music. A wonderful small group in Leavenworth, Kansas, in which singing was participatory, and only one guitar aided. The guitarist-leader was as sincere as they come, and humble. He wasn’t aware that his sense of meter was frequently off, although his pulse was good: we would have measures of 5/4, 6/4, and 7/4 in a standard 4/4 song, because his strumming would just keep going. But we did worship. In our home in rural NY state, a group would sing almost every Sunday night, in conjunction with the most serious, sustained scriptural digging one can imagine. Often, this was a cappella simply because it was simpler. But when we had electronic piano or guitar or ukulele or flute or viola, the instruments typically were effective aids to the worship springing from the hearts. We sang “I Will Praise Him Still” and “Brethren, We Have Met To Worship” and — oh, yes — “Ancient Words,” because we were so devoted to the ancient scripture that we were understanding better than ever. Of course, instruments have limitations; they are, after all, mechanical. However, I daresay, in further response to Phil from years ago, that voices don’t often teach or admonish or even speak, any more than instruments do those things. CofCers: when was the last time you really intentionally taught someone, or a group of someones, through a song? Did you look at him or her when you were speaking? When was the last time you felt personally admonished via a song sung in church? Individuals certainly worship while sitting in pews, but I’d even assert here that it’s relatively infrequent that the corporate aspect of worship makes much difference. In other words, the individuals are using their voices and their minds and their hearts in worship while everyone’s gathered, but the spiritual reality isn’t all that much different from what it would be if that same person were alone in her living room. We have wooly eye coverings if we think that we, by simple virtue of the the so-called “pure voice” and by the lack of instruments, are fulfilling the verbs of Ephesians 5 and Colossians 3. I affirm that instrumentalists do have something to offer churches. But we shouldn’t feel that that something is necessary in all the meetings and activities of the gathered congregation. Thus ends this autobiographical look at instruments in corporate worship. If you look hard enough, you can see that my weird boomerang has landed, at least for now, within a stone’s throw of its original fling-point. 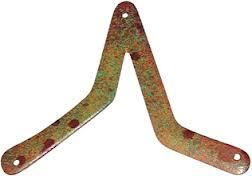 Where that stick-y boomerang now lies is in a lush, green meadow where united Christian voices sing all types of songs — sometimes, aided by well-executed instrumental sounds, but often, not. I’m pausing to insert something into my three planned essays on instrumental music and corporate worship. Here, in a sort of special edition, are some reflections on comments from Steve K. (You may find his complete comments attached to the last post.) After reading Steve’s comments, I knew I had to do something with them.
. . . sounds awful familiar . . .
. . . a cappella vs. instruments. . . . I could imagine that (1) some folks with the old CofC mindset would make what they thought was a funny point, letting their eyes connect the word “awful” with “instruments.” On the other hand, (2) those who have left non-instrumental music behind might prefer to associate “awful” with “a cappella.” The fact that I’m even bothering to type this paragraph may be as nonsensical as the overall topic to some of you. I tell you, though: it is beyond question that some old-schoolers would absolutely resort to such antics as in (1) above, in order to support their belief that instruments supposedly are awful in God’s mind. I have witnessed this sort of behavior in the past, although not too recently, thankfully. There is this old argument that employs the Greek word psallo (ψαλλω), toward which a cappella champions tend to rush. Although the usage seems to favor the “sing” meaning in the 1st century, the older meaning (plucking the strings of an instrument) also comes into play during the same time period (Rubel Shelly, Sing His Praise!, pp. 77f). Words are primarily defined in literary context, and even if it could be proven beyond a shadow that psallo meant precisely, only “singing” to New Covenant authors, that still wouldn’t prove that instruments weren’t used. The historical psalm and its verb form could also be be brought to bear here. Incidentally, around the 1st century and in later times that sought to reflect the Greek arts doctrine of ethos, plucked-string instruments appear to have been preferred, over winds and percussion and bowed strings, by and for the higher sorts of people. The associations of Greek and Roman cultures with certain instruments might well have been factors in Christian practices during the centuries immediately before and after Jesus. As Steve reminds us, the earliest Christians do appear to have worshipped without instruments. We ask why and are bumfuzzled & befuddled by the lack of information — other than some connections with synagogue worship of the 1st century, which result in part out of the Exile in Babylon. This Exile bit is one I hadn’t thought about, but it makes sense — and more so than the notion that the first Christians couldn’t use instruments because they had to hide in the catacombs. (Surely that was the case for some, but it wouldn’t have been the reason instruments weren’t used.) Even though synagogue practice, as I’ve understood, was typically a cappella, that mere fact is impotent to illuminate the reasons(s) for any lack of instruments in later Christian worship. There is this deafening silence about instruments in the NC writings. What to do with that silence? Notable scholars in Christian history, quite apart from the American Restoration Movement, have gone on record about the early a cappella practices. The historical notes of John Calvin and either F.F. Bruce or William Barclay (I forget which of the latter) are sometimes quoted by a cappella prophets, yet I have not been convinced that their words suggest any divine intention for all time. Speaking of moving, a few highly visible CofC preacher-leaders have pastored their flocks through motions into a state in which instrumental music is OK in the assembly. Chief among these are Rick Atchley of The Hills near Ft. Worth, and Max Lucado, formerly the preaching minister at Oak Hills Church in San Antonio. Those moves, believe me, were not made without thought or consternation. They were made over a long period of time, and they have resulted in angst and critique, as well as presumed growth and openness to those of other traditions. Not incidentally, it might be noted that neither of those churches carries the name Church of Christ as prominently, or at all. Other, less celebrated congregations have also moved toward instruments in one or more of their regular assemblies. I’m grateful to Steve for spurring some additional comments here. My last essay on this topic is essentially ready and should be published in a couple of days. In this second autobiographical post, I’m picking up toward the end of explaining Phase Two and moving into Phase Three, where I currently find myself. These get shorter as they go, so I hope you’ll stay with me. . . .
>be hindered by it, but what if others are hindered? Your first statement (commenting only on the non-parenthetical portion) is a blanket generalization — one I cannot agree with without qualification. I cannot agree because my experience teaches me that there are exceptions although I admit there is a great tendency to overdo and to “hype” the techno-glitz of sound. The hindering of others should be considered, but if I had a nickel for every time somebody hindered my worship (because I let them, really) by doing something that no one would deny is an inherently OK thing to do. . . . The hindrance factor is not, in itself, a valid criterion upon which to judge the merits of an expedient or a tool or an addition. >Instruments cannot speak, teach or admonish. People use them not to fulfill the instruction, but because they want to. I don’t know about all people, but I do know that I use them with a purpose in mind . . . not whimsically or without thought. *When* I use them, I use them in order to aid something I believe God wants. Instruments cannot speak or teach, but they can help me and others do just those things. Phil, my studied freedom allows their use, but I respect that yours does not. I cannot draw such a sharp line of distinction between the voice and other instruments. I love to sing and do it regularly. I lead a group of a cappella musicians who sing for regional special events. I also play F horn in a local orchestra. I play piano and a few other things for personal enjoyment as well as in some of my worship. A good instrumentalist sees his instrument as an extension of himself, just like a baseball player feels the glove is a mere extension of his catching hand. My voice, while obviously a physiological part of me, is not totally under my control. (Remember Peter Brady on “The Brady Bunch” when his voice was changing?) My throat is sore right now, for instance, and so my voice will not act as I want it to at the moment. Likewise, when I play horn later this evening, my horn will be, to a degree proportional to my ability, an extension of myself and of my soul. It will not be totally under my control, either, and I will grant that it is *less* “me” than my voice is, of course. But the line you suggest is between a human-tissue instrument and other, manufactured instruments made from other materials. That line is not so sharp to me, for I have felt the piano truly speak for me at times — past the ends of my fingers — more than I’ve felt my weaker voice communicate what my soul feels. Can you accept from me that I have worshipped by and through my playing of the piano? No, it is not animate, and it cannot speak. B ut it helps the inner part of *me* speak, and as it does, the marriage of the piano’s mechanics, its acoustical properties, its wave forms can say, in combination with my will to express, some profound things. I don’t know if it goes without saying or not, but I personally feel completely free to use instruments, and I do so regularly. I would not introduce one in a typical Church of Christ setting, given the way things are now in our denomination. I do think instruments can quickly and easily take control of a person’s thoughts during an assembly; I would tend to use more acoustic, “low-key” instrumentation such as a single piano and/or guitar, adding perhaps a flute or something like that from time to time. Full, amplified bands with drums and the works have their place in larger settings, and I get into all that when I experience it, but my ideal church is a smaller, more intimate group, and it seems to me that the application for large instrumental groups is limited in small groups. It doesn’t matter much whether I would emphasize the same things in the same ways now, 15 years later. The point here is that I knew had been wrong, and I was moving. Or being flung? Like a weird boomerang, I was never to return to the precise point of origin (i.e., the conscientious aversion to instruments in worship). In part 3 — which will be more brief, I’ll describe where I am currently on this topic. Now would be a great time to hear from others of you. Describing whether you feel the same as you did a decade or two ago would be interesting, as well as your current position, if you’re willing to go on record. Feel free to write me privately, if you prefer to remain anonymous. As was the case with a recent post on a related subject, I’m fully aware that some who read this may be going,”Huh?” So, if I may (& I may! ), let me put this in more understandable terms. . . . Explanation of Phase One. I was raised to believe that instrumental worship was a mistaken, if not sinful, addition to the Christian assembly. This anti-instrument stance was unspoken much of the time in my moderate congregation; neither did my parents gravitate to the “brotherhood watchdogs” and their pet issues. I really have no way of knowing how many nearby siblings actually thought using instruments with worship was wrong, but the fact was, no one in my closest Christian circles used instruments in public, Christian gatherings (or talked about it openly if they did it in private). The anti-instrument thinking stems from an argument from silence that says, simplistically, “Because there is no explicit authorization of instruments in passages that speak to New-Covenant worship, instruments must be wrong.” At its best, this argument grows out of quite a sincere desire to do as God says. I remember writing a love song to a high school crush — a song whose lyrics spoke of God somehow, indirectly. I questioned myself on this — and felt uncomfortable when I played the song to get my mother’s feedback, but I don’t remember any censure from her. I thought it was probably OK since the God words were indirect enough, and it wasn’t worship per se, i.e., it wasn’t an expression to God Himself. Anyway, I held onto my boomerang, checking my grip and my stance and foot position. This phase lasted well through my college years and through my first teaching job. Over a period of a couple years, though, I grew out of thinking that way. My feet twitched. I dropped the boomerang to my side, preparing to change the grip, or the stance, or the direction of the launch, or some combination of the above. Explanation of Phase Two. I went on a walkabout, so to speak. Or I flung the boomerang. Take your pick. Many Sundays during a year or two, I would visit a different church, before or after being with my “own” church. I attended many worship events of various sizes in various buildings with various groups of various stripes. A couple of the best times were large-scale worship events hosted by Integrity Music. One of the worst experiences was a then-new Vineyard church near the Delaware-Maryland-Pennsylvania line, where barking like a dog was allowed to disturb someone’s penitent testimony. I bought and read books and articles on worship and on music in worship. I was usually disappointed with arguments on the non-instrument side. They didn’t hold water for me. Even the respected philosopher, teacher, and author Rubel Shelly (then preaching for a progressive CofC in Nashville, later President and then Professor/Religion Chancellor of Rochester College, a Christian institution in Michigan) wrote a little volume called Sing His Praise! in which he overtly upheld the traditional CofC non-instrument viewpoint. Shelly, who had influenced me greatly along restorationist, nondenominational, simple-Christian lines with his I Just Want To Be a Christian, left me flatly disappointed with this book on singing in worship. I believe the words were sincerely penned, but I also presumed that the publication of the book simultaneously represented an intent to satisfy conservatives who thought he had “gone liberal” in his other writings, when in reality he was more biblically conservative than they were. My own grandfather, Andy T. Ritchie, Jr., wrote a fine book on worship that was used as required reading in Christian college courses. This book, Thou Shalt Worship the Lord Thy God, was written on the heels of a period of particular numerical growth in the Church of Christ, and one might have expected the party line to have been vigorously articulated in such a book. I recalled no section on the use of instruments in worship, but I just pulled a copy off my shelf and had a look. Sure enough, although hints of the CofC mindset appear in the “Some Scriptural Criteria of Worship” chapter, my grandddaddy dismissed the “cold legalism” of some who would suggest that, simply because something is “within the bounds of law,” it is right. Instead, Granddaddy employed terms such as guiding principles and restraining influences instead of dealing in hard-nosed, supposed legal rules. Later, in the chapter touting singing as expression in general, Granddaddy did spend a grand total of a page making a brief case against instrumental music — because it is not “authorized” in the NC scriptures. All during Phase Two, I was leading and affirming a cappella worship, and arranging and composing scads of voices-only scores, never dreaming of introducing instruments in a milieu in which they would have disrupted unity. However, I no longer believed a cappella was the only, commanded way. >>have found that some worship music is better left unaccompanied. >>Instruments are tools and need discerning users. >God’s plan for our musical worship is to sing, speak, teach and admonish. >speak. Leave it alone, my brother. God doesn’t say, “This is my *plan* for your musical worship.” There are NT writings which speak to aspects of it, I’d say, but there is no comprehensive *plan* laid out which describes in detail every aspect. I’ll have to say you’re simply incorrect in your second sentence. My use of various instruments, and my listening to worship music which is sometimes accompanied by non-vocal instruments, DOES help me worship. You really cannot know what does or does not help me commune with God. I will qualify the above by noting that simply because I feel that something helps me doesn’t mean I should do it. But in this case, I believe at this juncture in my development that there is no Biblical injunction against any certain instrument, and so I am personally free to use other instruments. Silence where the Bible is silent, while not stated as a maxim in the Bible per se, seems both logical and scripturally implicit. >than sing, speak, teach or admonish. The tool you use is not like Noah’s tools. The tool I use often is my digital piano. It helps me build new songs, and it helps me arrange songs for various media. It helps me meditate, and it helps me worship. It aids my vision for glorious praise, and it is quite a practical aid in preparing rehearsal tapes for others to learn music. My tool does not worship, and it is not an animate being; it is simply, for me, a tool which my Lord has freed me to use for His honor. Like a weird boomerang that doesn’t take the anticipated path, I was never to return to the precise point of origin (i.e., the conscientious aversion to instruments in worship). I had been flung, so to speak. In part 2 of “A Weird Boomerang,” I’ll include a little more of this past conversation, now nearly 15 years old. Then I’ll describe the current boomerang trajectory and invite readers to describe their own journeys (maybe more briefly than I have!). Where we live at present, some of our dearest friends had been unfamiliar with the American Restoration Movement (Church of Christ, Christian Church, etc.). This unfamiliarity is certainly understandable. A quick check of a couple of Wiki articles places Churches of Christ, the group of my own heritage, much higher on the denominational demographics charts than I had thought, but still, relatively unlikely to be noticed by many others in Christendom. I’ve recently had connections with the Wesleyan branch of Methodism, for instance, and I knew that the CofC had many more adherents and congregations than the Wesleyans, but I didn’t know how great the difference was. Churches of Christ are sixth in terms of presence in counties — behind the United Methodist Church, Catholic Church, Eastern Orthodox Church, Southern Baptist Convention and Assemblies of God. The average number of adherents per county was low at 677. With more than 5 million members reported, it is reported that the CofC is somewhat larger, worldwide, than the main Lutheran organization, and than the two main Presbyterian groups in the U.S.² It is also more than twice as large as the Episcopal Church of the U.S.
For any regular readers who have not been associated historically with the RM or the CofC, I thought the above might be of interest. Personally, I’m not energized by such stats — i.e., about where “my” group falls at this or place on the charts. I don’t really believe in congregational membership per se, and I don’t “place membership,” but I do believe in hearty participation in local church work. My primary “membership,” then, goes beyond CofC walls. I’m much more enthused by Godly disciples, sound principles, and solid exegesis, and I’m grateful for the good examples I’ve had from within my church associations — and from without. I’m also grateful for some of the longstanding, biblically substantiated scruples of the CofC — for instance, the lack of supra-biblical creed. A couple of years ago, an acquaintance mentioned that he didn’t understand any church’s holding forth the sola scriptura principle. “Everything is in the creeds,” he said. (He’s a nice guy, and now a friend, but I believe he’s misguided on that point.) It is said that this principle of intentional, singular reliance on scripture was a major cause of the 16th-century Reformation, in that it devalued supposedly infallible “ex cathedra” pronouncements on which Roman Catholics insist. The church groups who continue in the RM tradition (not the Disciples of Christ, anymore) are among those who continue to press the sola scriptura point, and this is but one area in which I am grateful for CofC influence. The application is sometimes shallow, but it is good-hearted and on-target at its core. It appears Jack Reese, an author, preacher, and professor from a CofC/RM university, has similar feelings about our shared heritage. . . .
Jack Reese is Dean of the College of Biblical Studies Dean of the Graduate School of Theology at Abilene Christian University. ¹ Mac Lynn’s Where the Saints Meet (a well-known CofC population tabulation, 1987-88 ed.) reports that states with the largest numbers of Church of Christ congregations were Texas, Tennessee, Alabama, and Arkansas (in decreasing order). Other states with ~300 or more congregations (in no particular order): Oklahoma, Missouri, Mississippi, Georgia, Florida, Kentucky, Illinois, Indiana, and Ohio. My somewhat informed guess is that, in the last four states listed, the size of the average CofC congregation is relatively small, and the nature of the congregation, generally more narrow and isolated from other religious groups. This guess relates to the history of, e.g., Daniel Sommer (IL) and the Christian Church’s strength (KY). ² Presbyterians may have more inner strife and factions that the RM. I might have missed the 2nd largest Presbyterian group in my scan — there are so many more than I knew of! We humans can be really hypocritical inconsistent. 1. Some Mormons once told me they were forbidden to drink any coffee or tea, because caffeine was addictive. The restriction, which I believe was universal, i.e., not specific to a ward/district, excluded herbal tea, which is not tea, strictly speaking, and which contains no caffeine at all. On the other hand, Mormons were allowed to drink hot chocolate, which does have caffeine. Hmm. And we won’t even get into the rather blatant, blasphemous inconsistency presented by the very existence of the Book of Mormon. 2. As I understand it, Amish citizens are ruled by local bishops, at least in some respects; some of the rules do change by the district/area. I know of one Amish man who agreed to advertise his repair business through a local community theater, which was at the time producing The Sound of Music. Leaving alone the generally wholesome nature of this particular show — it ain’t Gypsy or Rent, after all — I found interesting the connections between racial/religious persecution (well known in Amish history) and the Alpine area from which this Amish man’s family originated. He had no prior conception of the show, but there developed a conflict. His decision to advertise in The Sound of Music program was overruled by his bishop; the man retracted his ad, but generously, strangely allowed the money to remain in the hands of the theater organization. Hmm. Didn’t want to be associated with something in print, but allowed his money to support the enterprise. It’s commonly known that Amish folks are forbidden to have telephones as communication devices in their homes, and yet some are allowed, by special dispensation. Telephones are either tools of the devil or not, right? Amish folks do not have electricity, yet they run hot water heaters on diesel fuel. So many inconsistencies. Please know that these paragraphs are not intended as a special indictment of the Amish. We live near quite a few of them and consider one family our friends. All the Amish I’ve ever interacted with are pleasant, charming, industrious, decent people. Although they attempt to live devotedly plainly and unspotted from the world, they are, in another way, quite like the rest of us: they are inconsistent and have some really silly rules. 3. Churches of Christ are notorious for disallowing women from participating in certain roles. One particularly striking, stark example is that, traditionally, women do not serve the elements of communion while standing and passing the trays from row to row. However, women almost always pass the trays from side to side on a given pew. Perpendicular service is not okay, but parallel service is? Hmm. Contrast the above lack of opportunity to serve with the frequent identification of church women as very good cooks who serve wonderfully at congregational meals. In one case, we forbid serving, and in another, we essentially require them to serve. I see another inconsistency in the common notions of “Sabbath”: despite the biblical fact that there is no Christian Sabbath — it was a Jewish thing with no documented, post-Pentecost manifestation — we look down our noses at those who rake leaves or wash their cars (do laundry? wash dishes? pick up toys?) on Sunday, and yet we have church staff who are required to work on the same day. Here, we could eradicate church staff altogether and solve the problem, 😮 or we could at least stop holding tenaciously, with what I tend to take as false piety, to an a-biblical idea. What are some other inconsistencies found within Christendom? Recently my blog has attracted a dozen or so regular followers who don’t appear to have Christian underpinnings. I’m glad for these new readers. But I’m sometimes embarrassed about the inconsistencies seen within Christianity. Those from without can see them; why can’t we see them from within, and make adjustments in our thinking and practice? Names (2) — nondenominationalism everywhere? I once delivered a full-length sermon on the topic “the denominationalism within us”—to the horror of several siblings who had some wool shreds near their chins and noses (the wool’s having been pulled down from above). Born ‘n bred as nondenominational Christians, they were more than offended to be accused of being denominational. Yes, Virginia, there is denominationalism within the Church of Christ. There is no doubt about this. Despite not having an earthly headquarters (a plus in many respects), any real system of ordination (a plus in most respects), a general conference (a plus in all respects), etc., “we” are a Yellow-pages-identifiable religious group that has a name. That makes us a denomination, period. Once the Stone and Campbell movements united and became one church, a story I shall be relating, they settled the name issue by calling themselves by both names, Christians and Disciples, and their congregations were variously known as Disciples of Christ, Christian Churches, and Churches of Christ. It was unusual — a church with three names! The cruel irony is that once this unity movement betrayed its own heritage and divided into three churches, a sad story that I will also relate, each of the churches ended up wearing one of the three names, and for the most part only that name. I perpetually find myself with mouth agape when I see evidence that human allegiance can still be paid to these human labels, or to any like them. Although denominational loyalties seem far weaker than they were years ago, they are still with us. People consider themselves “Methodists” and “Episcopals” and “Assembly of God” more than “Christians.” Not being one for mob mentalities, I don’t get it. But again: what is it to be Christian? I grew up thinking it meant “Christ-like.” I don’t think that’s as helpful a definition anymore, though. In the sermon referred to above, I defined “Christian” as I would define “Bostonian”: the suffix “-ian” designates one who is of something, possessed by something, belongs to something. A Bostonian is of Boston and in some sense belongs to Boston. A Christian, likewise, is of Christ, possessed by Christ. The definition of “Christian” is infinitely more important than affiliation with any denominated subgroup within Christendom. I have for years taken exception to those ARMers who try to suggest that the reference to “breaking bread” near the end of Acts 2 refers to what we think of as the Lord’s Supper. (Please stay with me to the end of this post.) In verse 42, many of “them” have said, it is the “Lord’s Supper” being referred to, while virtually none of “them” would have said “breaking bread” in v. 46 has the same event as its referent. That inconsistency is galling. It’s the same expression, penned by the same writer, in the same book, and in the same immediate context. How could it possibly mean anything different the second time? Whatever “breaking bread” means in v. 42 must be what it means in v. 46. Moreover, the nearly amusing (to us, at least, two millennia later) incident wth Eutychus has shown to some that it was very important to Paul and to the disciples there that they have “the Lord’s Supper” together. Some, however, have conveniently ignored the second reference to breaking bread after midnight. Without checking other time references in Luke-Acts, I would suspect that Luke reckons time as the Greeks would have, not as the Jews would have; if this assumption is correct, you have these Acts 20 Troas folks meeting on Sunday evening and observing “the Lord’s Supper” on the 2nd day of the week, after midnight. Or, perhaps, you have them meeting to observe the Supper and then having a six-hour sermon and then observing “the supper” again. I don’t really think either of these expresses full truth. What if there was a table fellowship that they all looked toward, and there was a special significance on the first day of the week, when they remembered Jesus’ body and blood in a special way? What if they did this twice at Troas (Acts 20)? Or what if the ceremonial remembering didn’t actually occur at all that night, because of the near-tragedy with Eutychus? Had they erred¹ religiously (here I’m intentional with the choice of “religiously” over “spiritually”) and displeased God, simply because they didn’t observe a ceremony? Isn’t communion more than ritual observance? At this point, I would formally put forward the notion that the “Lord’s Supper” might never have been conceived by Jesus or by the Father in the way that most of us have conceived of it through the years. I do absolutely think He wanted us to remember him in a focused way at the table. But I also think he wanted us to participate in table sharing for its own sake, because of what such sharing of food and conversation can create among us, pausing during the meal to remember his sacrifice especially, through bread and vine juice. Pardon my bold speculation, but I doubt He particularly prefers the stoic observances that are the rule these days in liturgical and non-liturgical churches alike. The dis-integrated experience of bread and thimbleful of vine juice, while looking at the backs of others’ heads or at Bibles or while praying silently, whether in silence or with “special music” being offered, has very little to do with the communion practiced by Jesus at the Last Supper or with that He wants for us today. Alan Knox’s minor flaw, by the way, was semantic and was found in his summary calculations–that certain phrases were used X number of times to refer to “the Lord’s Supper.” The term “the Lord’s Supper,” I think, throws us off the scent. It is not what we think of as “the Lord’s Supper” that’s the issue. Instead, it is the nature of the Christian assembly that deserves a serious look (which is consistent with how I read Alan’s overall thrust). Let’s eat together more often. In homes, preferably. In the church building or in restaurants, if necessary. But let’s eat together, and let’s be spiritually minded enough not only to bless the food in the name of God, but to remember—specifically and intentionally, during the meal—the sacrifice of our Lord Jesus. In doing this, the “supper” (or lunch or brunch or whatever) can become “the Lord’s” in a very meaningful way.